UNICEF Ambassador Clay Aiken has asked the world to remember Somalia, where war and famine have combined to cause one of the world's worst humanitarian crises. In a story reported by Reuters, Aiken says there has been scant U.S. and international attention to Somalia since a failed military intervention a decade and a half ago. There hasn't been much discussion of Somalia since the early 1990s in the U.S. The American population kind of got a bad taste of Somalia in the early 90's and hasn't really had much interest in the country since. Somalia has been torn by civil war for nearly twenty years, with problems exacerbated by continued insurgency against an unstable central government. Aiken has been on previous UNICEF field missions to observe rebuilding following the tsunami in Indonesia, to talk with children in IDP camps and UNICEF centers who had been forced to flee from rebel forces in Northern Uganda, to Afghanistan to witness education programs for girls and women in the post-Taliban era, and to Chiapas, Mexico, to visit survivors of devastating floods late last year. It's the most dangerous place for a child to be. In the lower part of the country, southern part, I feel it's a more desperate situation than any place we've ever been." More information as it becomes available, along with links to a UNICEF in Somalia fundraising campaign currently being developed. Somalia remains volatile, beset by internal political crisis and conflict, a country severely affected by the repercussions of more than ten years of war, economic decline and destruction. Already one of the poorest countries in the world at the onset of the nineties, conditions of extreme poverty now largely prevail, with very few services and grave health risks experienced by the most vulnerable groups, children and women. If you're new to the fabulous concept of Pandora Radio, you can read about it in the first part of my exploration here Pandora Path to On My Way Here. I could have spent days just exploring the 3 songs I started my radio stations at Pandora with and enjoying the new artists I was fortunate to find. I've already downloaded the entire Freezer Door album from iTunes and checked out their myspace . I bought some Johnathan Rice and after listening to more songs on his Myspace, I went back to iTunes and bought more. But I had such a blast I couldn't wait to continue my journey with Part 2 - and chose to work with 3 new songs: Falling, Where I Draw The Line and Ashes. First up is Parlor by Kent – a Swedish group of the 1990s. Has the same electric rock instrumentation and subtle use of vocal harmony and the minor key tonality. Thumbs up and a chance to learn more about Kent. Hooked Up by Minibar shows up next. This song is listed as a similar song to Falling by Clay Aiken and it’s no surprise that I liked it a lot and also that I grabbed it from iTunes. Interesting band, originally from UK and relocated to California in 1999 – they have a distinctly American sound – hook-ridden poppy songs and very cool – similarities to Falling are the electric rock instrumentation; subtle use of vocal harmony, acoustic rhythm guitar, minor key tonality, plus electric guitar riffs. Their Minibar Myspace is a great place to hear more music and learn a bit about them. I actually like this country influence with terrific harmonic riffs. Thumbs up for sure. What I find so interesting is the connection to a lot of alt/indie/country sounds I'm getting with Clay's Falling. I'm really hoping that those listeners who are getting Clay's song when they take their journey from the other end are actually giving it a chance and listening. They may discover his music the way I'm discovering new artists to me. Hero's Welcome by Lodger is next and while I can’t figure out why – I just don’t care for the lead singer's voice. Listened for a minute or so and then thumbs down. subtle use of vocal harmony, minor vocal tonality, electric rhythm guitar, prominent percussion, plus acoustic rhythm piano and mild rhythm syncopation. And thumbs up for me for sure! Interesting connection to Falling and it was a treat to hear it pop up unexpectedly. Love this song up next by an Austin, TX group called Palaxy Tracks is Camera which has much of the same features but an addition of mellow rock instrumentation and intricate melodic phrasing. And I like it a lot so off to iTunes to buy it. Death Cab For Cutie happens to be one of my favorite indie groups and Soul Meets Body from their Plan Album is up next – which again has the minor vocal tonality and subtle use of vocal harmony and acoustic rhythm guitars – plus the addition of subtle use of strings. This is already on my iPod so it definitely gets a thumbs up. Alice Cooper’s Pick Up The Bones is next and his voice grates so just not interested. Blue Jean by The Cloud Room comes up after that and again, it just doesn’t seem to be moving me in the direction I want to go so thumbs down. Last Goodbye – The Gufs another group I've never heard of and am glad to discover. Lots similar to Falling and I definitely like it. From their Holiday From You 1999 album. Bought it on iTunes and I’ll stop back and pick up a few more tracks I’m sure. Milwaukee band – have toured with Rob Thomas. Why don’t I know about them? Seven years since their last album they are recording again. They’re great! Thanks Pandora. And a great place to end this path for now . . . I’ll definitely be back. and it gets a thumbs up from me. Once again, I'm hearing an artist I never heard before -- Jesse Malin singing Love Streams. Interesting background on the artist, Jesse Malin, and since they say "His love for Neil Young, Tom Waits, and Steve Earle affected his work" and those are three of my favorites - it's no surprise that I really like this. Once again, it's too easy to buy stuff from iTunes and I'm hitting my account a lot!!! I'm veering a bit too country with the next song, Witching Hour by Austin Collins. Many people have said they hear a country-crossover possibility for Where I Draw The Line - and obviously so does Pandora as they are definitely giving me songs with country influences. And this song lists Where I Draw The Line as a similar song in their About The Song section. I'm enjoying this even though it's probably more country than I want to go - but I play it through with a thumbs up to see where I'm taken next. Surprising, next song isn't anywhere near as country but it's definitely good -- Flaming Wreck by Pernice Brothers. There's a little bit of Colin Blunstone of The Zombies in the vocals of lead singer, Joe Pernice, and as a huge Zombies fan - that's a good thing! And after that - Falling shows up and boy does that sound great. What a terrific radio station this is turning into and of course, ending it with Falling is a great way to move on to Ashes. I'll definitely be back to see what else Where I Draw The Line brings me. I'm curious to see where this takes me - as this has the major key tonality that Falling and Where I Draw The Line do not - and this also has a notation of a "country influence". First song up is Switchfoot's Dare You To Move – which is a kind of sweeping anthem that’s pretty good from Switchfoot and it has a great bass – so thumbs up. Carry You by Jimmy Eats World is next and this definitely gets a thumbs up from me, plus a trip to iTunes for the download and a visit to their Myspace. I remember hearing Jimmy Eat World in the late 1990s and early 2000s - a lot of people did. But lost track and hadn't really heard anything recent. Which is a shame because they are really good. This is from their 2007 release Chase The Light. I'm glad Pandora reintroduced me to them. Next up is another Jesse Malin song, On to Tomorrow Night . I already gave him a thumbs up for anther song that showed up in my previous station - and this one is deserving of another trip to iTunes. Portastic’s You Blank is a change of pace – It started to grow on me the more I listened but just couldn’t get into Mac McCaughan’s voice that much – so decided for now to give it a thumbs down and see where I go next --- which was to David Mead. I like him and find Make It Right really catchy. It’s a great little pop song – unaffected vocals and good mix of mixed acoustic and electric instrumentation. And, according toDavid's Myspace, he's a Brooklyn boy - so definite thumbs up! My next song is It’s the Only One You’ve Got by 3 Doors Down . Wow - I really love this song – great guitar riffs and lyrics. I've head their single, It's Not My Time and liked it - but I really love Only One You've Got. It's got a gutsy, rousing feel to it that I think is actually very similar to Ashes. I went and got the whole self-titled album from iTunes. Jack Ingram’s What Makes You Say brings in a bit of the country influence but I’m not getting into it so I click on thumbs down. Perfumed Letter by Bill Mallonee is next and again, someone I’ve never heard of, but a song I really like. Lyrically interesting and has a bit of the British invasion feel to it in the slightly psychedic feel to the music. Perfumed Letter is a 2003 release - but I went to his MySpace to hear his more recent stuff. I can't believe he's released 25 albums and I'm only just hearing him. Golden Smog with Can’t Even Tie Your Own Shoes and another one that gets thumbs up followed by Replay by All Our Good Friends . This is a bit too “precious” for me - doesn’t have the drive I’m looking for so I hit thumbs down and take a real turn back into a more rock feel with Make Ends Meet with Connor O’Brien . This song is terrific - with great percussion and the addition of a wah wah pedal. Big thumbs up and a trip to iTunes. Jimmy Eat World is back with Chase This Light and some new features like the introduction of "folk influences” and” a good dose of acoustic guitar pickin'”. Great energy and huge chorus and and a thumbs up for sure. Once again, I've added some great stuff to my iPod, and had a blast doing it. Ashes, Falling and Where I Draw The Line are 3 of my favorites from Clay's On My Way Here. It's obvious to me that many of the musical features in these songs are what I'm looking for when I gravitate to other music. Supporting a site like Pandora Radio makes a lot of sense. 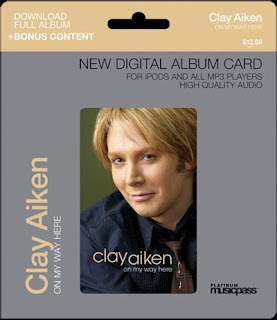 Here's hoping that others are discovering Clay Aiken's new music in the same way. Part 3 will be coming with Weight Of The World, As Long As We're Here and Sacrificial Love. Should be interesting. I love hearing about the music you're discovering - so please comment and tell me what you've found that I might have missed! Many of the regular readers of ConCLAYve are familiar with my love of the internet radio station Pandora. I've discovered so much wonderful music creating radio stations with seeds of artists like Georgie Fame or Peter Cincotti or from songs like Van Morrison's Moondance. 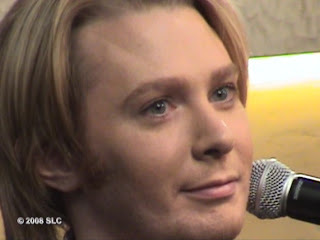 I've also used Pandora to explore Clay Aiken early in his career after Measure of A Man, and then again during the release of A Thousand Different Ways. But I was most excited to see what new music I could find when Pandora included On My Way Here into their database and now I'm having a blast! At Pandora, we have a single mission: To play music you'll love - and nothing else.
. . . Since we started back in 2000, we have been hard at work on the Music Genome Project. It's the most comprehensive analysis of music ever undertaken. Together our team of fifty musician-analysts has been listening to music, one song at a time, studying and collecting literally hundreds of musical details on every song. It takes 20-30 minutes per song to capture all of the little details that give each recording its magical sound - melody, harmony, instrumentation, rhythm, vocals, lyrics ... and more - close to 400 attributes! We continue this work every day to keep up with the incredible flow of great new music coming from studios, stadiums and garages around the country. You can create as many "stations" as you want. And you can even refine them. If it's not quite right you can tell it so and it will get better for you. What a concept! Music without the labels. Music that's not pushed on the radio only. Music that's not deemed "cool" or "uncool" by bloggers or corporate hacks. And boy have I found music I would never have found without the help of Pandora. And my iPod bulges with stuff I'd never have a chance to hear otherwise. So imagine how excited I was when I checked and finally On My Way Here showed up in the Music Genome database!!! Now, I love this album and find myself drawn to it almost every day. I'm still constantly discovering new things about each song and my favorites keep changing. But, while there is definitely a consistent theme in this album, the songs themselves range quite a bit in genre for me - so I thought it would be most exciting to discover the different paths each individual song would take me on. Because of that - I'm going to definitely have to break this exploration into a number of different blogs. I'm having too much fun to try to fit it all into one. Thumbs up for me. Next up is Nich Lachey, This I Swear and it's moving into a too romantic and predictable path for me so I hit thumbs down and move on to Bonnie Raitt, My Opening Farewell. I love Bonnie's voice and even though this song isn't my favorite of hers, it's already on my iPod and I click thumbs up. Of course this got a thumbs up! So now I think it's time to move on to a song that, in my mind, is not a typical Clay Aiken song and see what music I get led to. I really liked this song, knew nothing about Johnathan Rice, but bought this single from iTunes. The great thing about Pandora is that it gives you lots of information about the artist, the album and the song and you can find it with a click of a link. Mother Hips? Singing Mother Hips? I love Pandora!!! Never heard of it but it got a thumbs up for me. And then I got Little Black Heart by Sister Hazel - another new one for me and another trip to iTunes. and no surprise, I really liked this song. This is a 2008 release and I have no idea where these guys have been hiding - but thank goodness for Pandora. I checked them out on Amazon and listened to the snippets from this album - liked it so much I bought the whole album from iTunes. This path I'm taking from Everything I Don't Need is getting expensive! And another thumbs up. And another song I've never heard or an artist I never heard of . . . Sink by Basshound. And another trip to iTunes. But unfortunately, this song isn't there and it's out of stock on Amazon. Well, I could stay all day wandering down this path . . . but I know I can always return to this radio station - so now I'm ready to try something else. A lovely song and a thumbs up for me. Next up is Have I Told You Lately That I Love You by Malachi. I love Van Morrison's version of this song and while there's nothing wrong with this version, it's nothing special so I decided to give it a thumbs down just to see what happens next. And the next song is Jason Mraz's Mr. Curiosity. What an interesting song this is. It's a little "precious" but I quite like it's intricate melody and phrasing and the piano work so it gets a thumbs up from me and another trip to iTunes. And in the similar songs area - one of the first songs listed is Lover All Alone by Clay Aiken. Good company! Celine Dion was next with Miracle and even though I can appreciate the beauty of her voice - I'm not feeling this is the direction I want to take this radio station in so I choose thumbs down. Erasure is next with Love Affair - and the additional element of an emotional male lead vocal performance. Michael Ball doing Raise Me Up is next and that's just not the direction I want to go with this journey so thumbs down for me. Indigo Girls and All That We Left In are next and I'm a big fan of theirs. This is adding a folk influence with beautiful harmonies and poetic and meaninful lyrics. I've already got this on my iPod - but it was great hearing it connected to Clay's Lover All Alone. I'd better stop here because I'm going to run out of time and money. Interesting that the three songs I've seeded my radio stations with so far all have "major" key tonality. Check back in a few days for Part 2 of the Pandora Path: On My Way Here. I think I'll explore two of the songs that have "minor" key tonality, Where I Draw The Line and Falling and another "major" key tonality song, Ashes - just because I like it. Do your own exploring . . . and tell me about the new music you get exposed to. Your path will be different than mine by what you choose to give a thumbs up or a thumbs down to. But isn't it wonderful to have the opportunity to discover music that is right for you without the hype? Tell me about it!